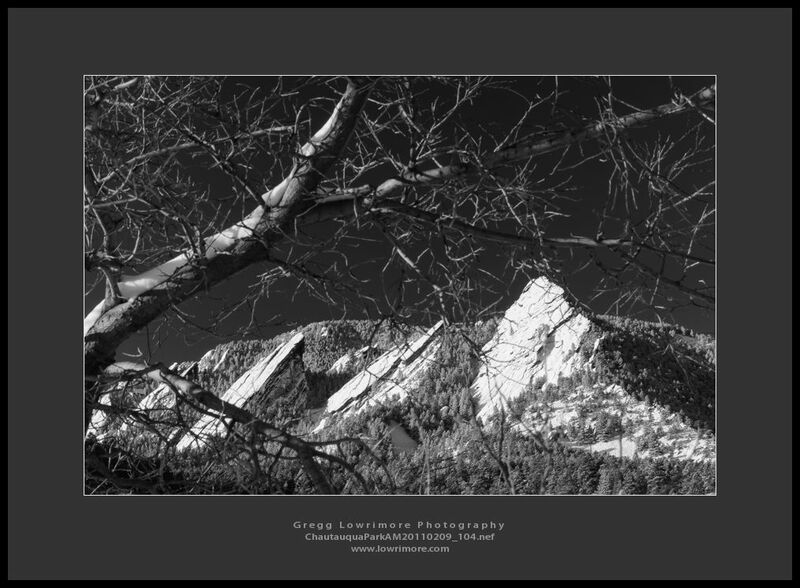 Day 2 / 5 Black and White Photo Challenge, nominated/challenged by Steve Parker. Today I nominated/challenged Andy Garza, and April Fischer. 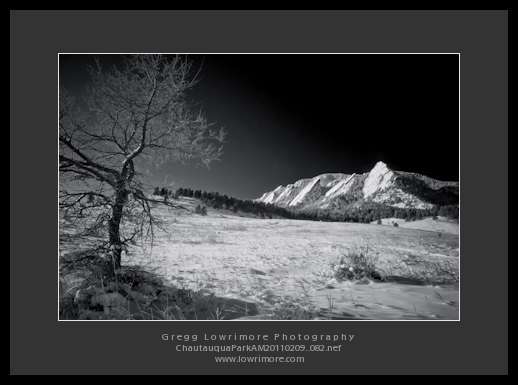 It’s optional, but try to post 1 BW image a day for 5 straight days, and each day nominate one+ person to the challenge. Good luck! 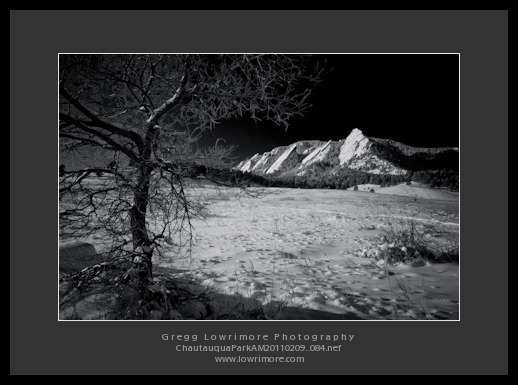 Posted in Fine Art, Landscapes and tagged black and white challenge, chautauqua park, cold, flatirons, freeze, snow, winter by greggl with no comments yet. I was up in Boulder checking out the fall colors along Mapleton Avenue and finding the gardners had just mowed there really drove me away. 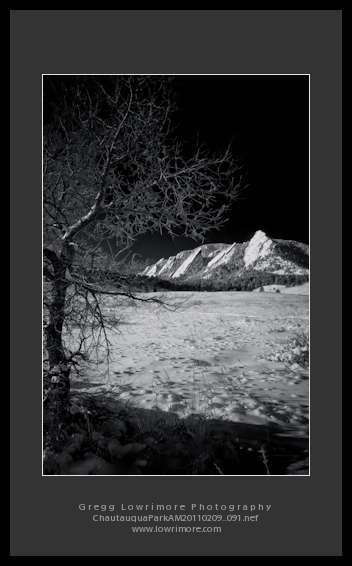 So I headed up to Chautauqua Park to see if I could catch the setting waxing crescent moon setting over the flatirons before heading to my monthly Colorado Nature Camera Club meeting. Perfect timing! I am still going through the couple hundred images I shot from that setting, but here’s one almost straight out of the camera. Also, you can see the flashlight from a late hiker(s) just coming down from the First Flatiron, near the ridge line, left of the moon. More to come from this shoot…. 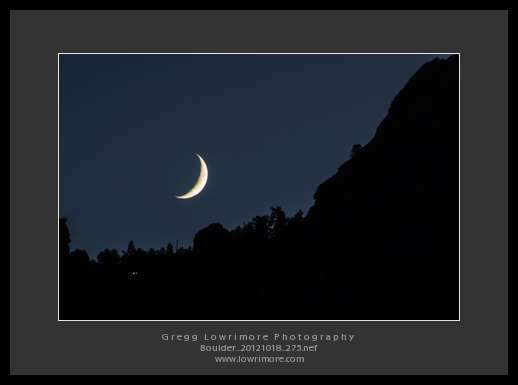 Posted in Landscapes, Shoots and tagged boulder, chautauqua park, flatirons, nighttime, sunset, Waxing Crescent Moon by greggl with no comments yet.